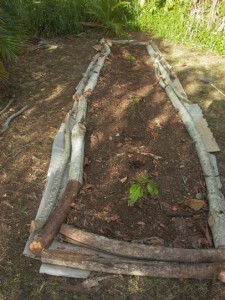 I’ve wanted to grow cacao here since we arrived. Not long before these pictures were taken, I bought a pod from a vendor at the sunshine market. 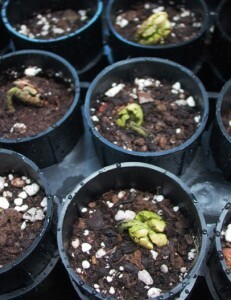 I hadn’t met anyone who had cacao to share, and this was my first contact with it, so I figured I would just go ahead and sprout these and get started. I probably should have been more methodical in choosing a variety to grow, but, this is how it came. 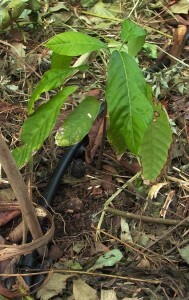 A cacao seedling and it’s irrigation drip. 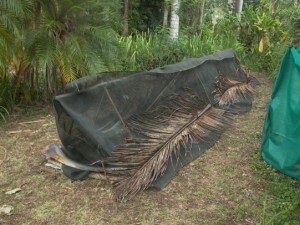 Young cacao protected from sun and wind. Later the Gliricidia will do this. I later learned that the pods were a criollo variety (criollo basically means ‘wild’) which is the basis for all of the best-quality chocolate made. Criollo beans, which have a distinctive character, are often blended with the more plentiful and bland forastero beans to achieve a flavor profile by the chocolatier. Our goals with the cacao are modest here; chocolate production on a resale scale would require a lot more planting that we will be able to do. We’ll use the beans to make cacao nibs which are useful and delicious on their own. 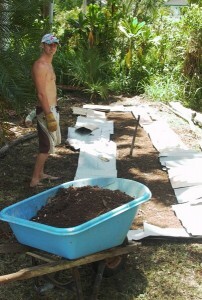 Of course, small-batch chocolate for our own use will be part of the plan as well.